Reddiplex are continually working with innovative companies in the development of pioneering design solutions that utilise our knowledge and expertise in the latest generation of polymers. 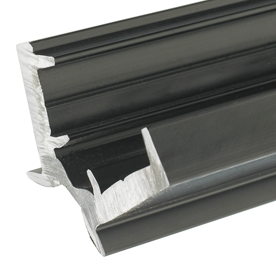 Through our experience in the extrusion of a wide range of complex materials we were able to assist Albert Jagger Limited in the exclusive manufacture of Centaflex a stylish; one piece, continuous hinge profile. The use of a flexible plastic comprising of a patented blend of polyester elastomers co-extruded with rigid PVC formed a profile that combines the high strength of engineering resins with excellent flexibility at extreme temperature variances. The co-extrusion ensured the two materials fuse at the point of interface forming a single profile that is extremely durable and resilient. The Centaflex Continuous Hinge is an example of the innovation in the vehicle industry of Albert Jagger Limited and our knowledge of material and extrusion technology.